A cross back feature on the Victoria Wedding Dress allows the sweetheart-cut bodice to create a truly figure hugging silhouette, which then flows through to a soft, georgette skirt. Tania Olsen Designs’ Victoria Wedding Dress features a ribbon lace up back on the bodice for a traditional twist on this modern wedding dress. An ornate, beaded lace bodice creates a beautiful figure-hugging silhouette, which flows through into a soft georgette skirt. 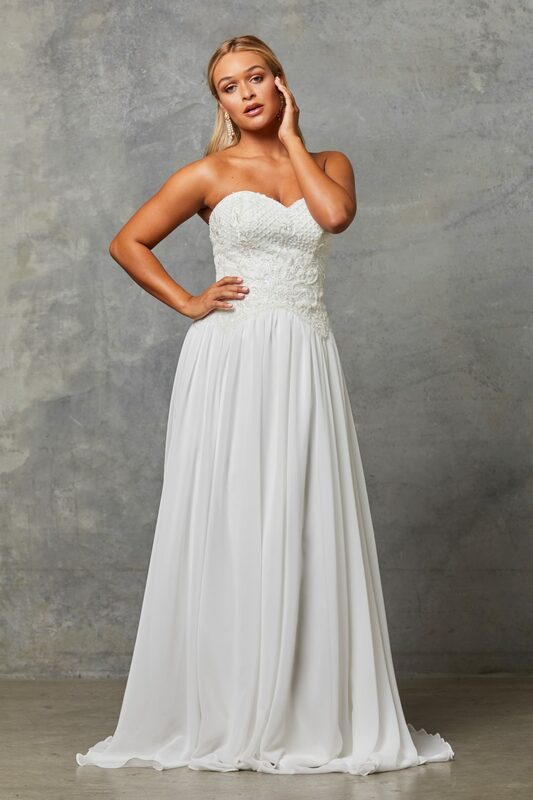 This Bridal gown by award-winning Australian designer Tania Olsen, is flattering for a range of shapes and sizes. Contact us to find out more about this beautiful dress.